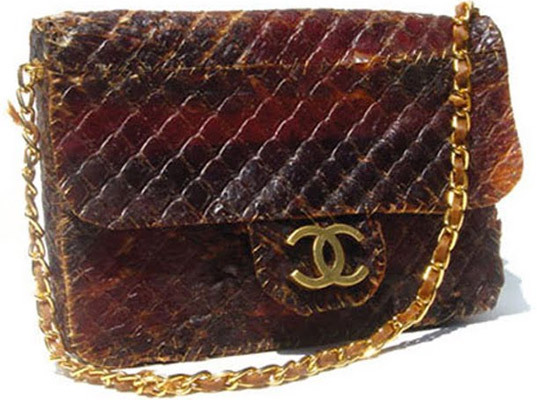 Chanel Bag Made From Beef Jerky: Gross or Glorious? If you think that meat is murder and wearing leather is just as grotesque, then Nancy Wu’s take on Chanel’s classic quilted bag might leave you vindicated—or nauseated; same difference. The product designer, who studied at Art Center College in California, hand-stitched sheets of beef jerky to create what she describes as a “highly desirable, lo-fi” accessory (whatever that means). Wonder what Kaiser Karl would say? If you think that meat is murder and wearing leather is just as grotesque, then Nancy Wu's take on Chanel's classic quilted bag might leave you vindicated�or nauseated; same difference. The product designer, who studied at Art Center College in California, hand-stitched sheets of beef jerky to create what she describes as a "highly desirable, lo-fi" accessory (whatever that means). Wonder what Kaiser Karl would say?